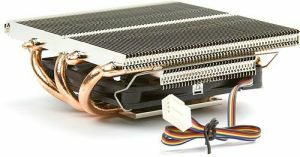 The Scythe Kozuti is a low profile top-flow CPU Cooler and is unlike regular coolers. 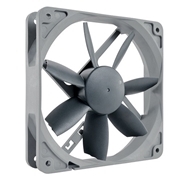 The 80mm fan is positioned below the fins thus significantly reducing the total height of the cooler. 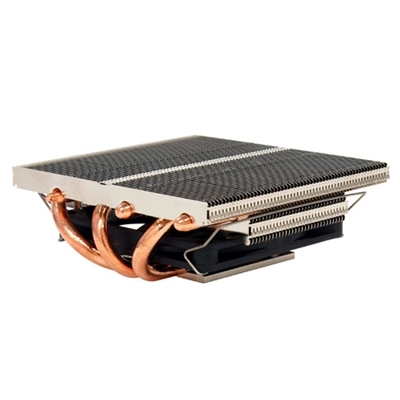 The Kozuti CPU Cooler is equipped with a total of three 6mm heat pipes. 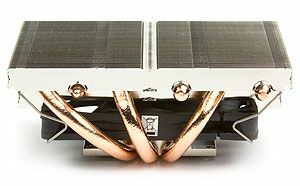 Applying the newly developed S.F.M.S (Stealth Fan Mounting Structure) the heatpipes are arranged in a low profile oval structure. This provides space for the 80 x 80 x 10mm fan in between the oval structure and below the fins, making it merely 40mm in height. Scythe's most compact and slim cooler will fit most HTPC style cases and other slim chassis systems where height above the CPU is limited. Due to it’s light weight, E.I.S. (Easy Installation with Screw system) has been applied. This omits the backplate which makes the installation simple and convenient. This also results in greater compatibility with many ITX motherboards having components on the back side of the PCB, making it an ideal solution for small footprint motherboards. Recommended for processors up to 65 Watt TDP. Usage up to 95 Watt TDP only with fan set to maximum fan speed. 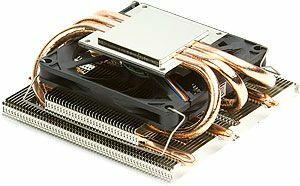 Scythe Kozuti Low Profile CPU Cooler. Scythe Kozuti base plate bottom view. Scythe Kozuti 3 heatpipe side view. By introducing the newly developed S.F.M.S. a super mini cooler -no taller than 40mm- is achieved by mounting a fan directly under the fins, which is compatible with more small form factor PCs, such as Mini-ITX case, slim case, etc. Easy and safe installation with screws instead of using a backplate. Fan speed is automatically regulated by the PWM signal of the mainboard. Equipped with new 80 x 10 mm fan, operating within the range of 800 to 3300 rpm, dependent on load.